CANCEL OR TURN OFF AUTO-RENEWAL? CAN I GET A REFUND OF MY BIGVU SUBSCRIPTION? BIGVU cannot issue a refund unless you subscribed on our website. All transactions are processed by iTunes and Google Play. Please make your request directly to Apple or Google. Request a Refund from Apple. Request a Refund from Google Play. Whether you subscribed to a monthly plan or to a yearly plan, you can stop your subscription whenever you choose to. No strings attached at BIGVU! After canceling your subscription, you get to keep your free account, all videos stored on our cloud are kept. Of course, you will be able to download all of your content anytime. I SIGNED UP FOR THE TRIAL BUT I DO NOT WANT TO CONTINUE. We offer a one-time free trial of the BIGVU subscription. You are able to try out all of the features for three days before you purchase the subscription. Auto-renew is turned on when you start the trial. When the three days are over, you will automatically be moved to the paid plan that you have chosen (Monthly or Yearly). If you do not want to subscribe, please disable the auto-renewal of the subscription before the end of your free trial, or else you will be charged. Apple: clicking on the link on your Apple device will take you directly to the App Store subscription page. Go into your phone's Apple Settings menu, and select iTunes & App Store. 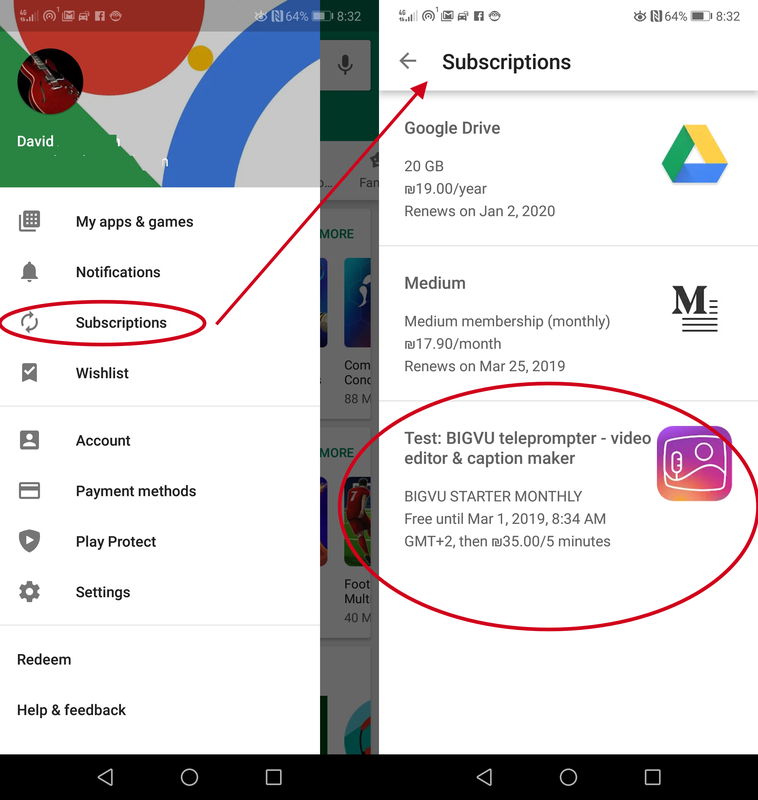 Where it says "Renewal Options," you can cancel the subscription and you will be able to continue the app for free with the BIGVU watermark. Find the subscription to BIGVU. BIGVU Desk: If you subscribed on BIGVU WEB Desk, login into desk.bigvu.tv, go to my profile and unsubscribe. Deleting the BIGVU app from your device does not delete your account, cancel your BIGVU Subscription, or cancel your free trial.